Thievery Corporation announce the release of Treasures from the Temple, a companion LP to the band’s chart-topping 2017 album "Temple of I & I." The 12-track compendium includes a collection of original recordings and remixes from the band’s Temple sessions at Geejam Studios in Port Antonio, Jamaica with vocal appearances by LouLou Ghelichkhani, Mr. Lif, Sitali, Racquel Jones, Natalia Clavier and Notch. The arrival of Thievery Corporation's Treasures from the Temple begins with rare footage from the deep roots of Reggae history dancing behind vocals from long-time contributor and American dancehall pioneer, Notch. The video for "Waiting Too Long" coincides with the celebration of the 4/20 holiday and sets the beat for a full, 12-track journey through a treasure trove of rarities, B-sides, and remixes of material recorded during the band’s Temple sessions at GeeJam Studios. As uncertainty falls across the digital landscape, a yearning emerges for the art and music that returns us to the roots of quality, culture, and community while empowering the same, future-forward mindset that has shaped the Thievery sound to date. 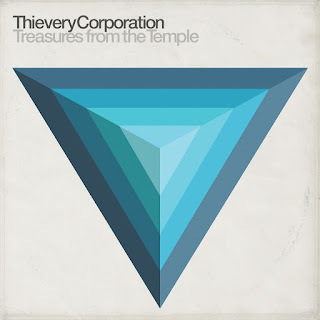 Treasures From The Temple is available in digital, CD, and vinyl formats at all major physical, digital, and streaming platforms through Thievery Corporation’s ESL Music imprint. Exclusive bundle packages and limited-edition merch are available directly to fans through the band’s website at: thieverycorporation.com/treasures. How many highly successful musical artists do you know that have thrived for 20 years without a radio hit, a big budget video, or major label backing? Moreover, have managed to do high-profile TV appearances, own and operate their own independent label since day one, sell several million albums and continue to expand their fan base across the globe each year. Thievery Corporationhave collaborated with such uniquely famed artists such as David Byrne, Perry Farrell, The Flaming Lips, Anushka Shankar, Femi Kuti, Seu Jorge, Bebel Gilberto, and have been featured on major film soundtracks such as Garden State. They’ve headlined top music festivals such as Coachella and Lollapalooza, and have influenced a whole generation of electronic producers and DJs. If you add these elements together, you can arrive at only one conclusion: Rob Garza and Eric Hilton, aka: Thievery Corporation. For more information visit thieverycorporation.com.